You can prepare doughnuts, the ultimate in indulgent, sugary confections, a number of ways, including both yeast-raised and cake-like doughnuts. 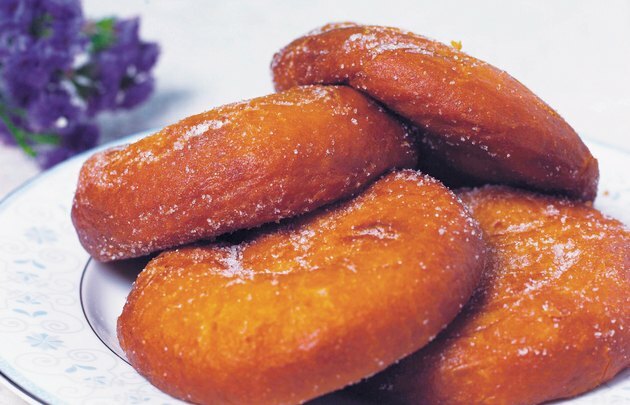 Traditionally deep-fried, cake doughnuts start with a flour batter made with baking powder, sugar, milk and butter. The batter is usually piped directly into hot oil in a doughnut shape or into doughnut molds for baking. Left to rest a while, the baking powder will firm up the batter, making it more like a dough that you can roll and shape by hand before frying. Combine flour, baking powder, salt and nutmeg in a large mixing bowl. For every dozen doughnuts you wish to make, use about 3 cups flour, 3 tablespoons of baking soda, about a 1/2 teaspoon of salt and a dash or so of nutmeg. Beat together the eggs, sugar and vanilla extract with a stand or handheld mixer in a separate mixing bowl, until the mixture is thick and light yellow in color from the eggs. Use two eggs and about 2/3 cup of sugar for every dozen of doughnuts you wish to make. Add the flour mixture little by little into the egg and sugar mixture, alternating with milk and melted butter until all the ingredients are combined. Use a 1/2 cup of milk and 3 tablespoons of melted butter. The mixer should be on low speed as you add the additional ingredients. Continue mixing until a soft, thick batter forms. Cover the bowl with plastic wrap and let it rest at room temperature for 10 to 30 minutes before using. If you wish to pipe the batter into doughnut shapes, leave it to rest for no more than 10 to 15 minutes. If you want it to thicken enough to create a soft dough that you can roll, let it rest for the full 30 minutes. To fry the doughnuts from the batter, fill a piping bag with the batter and pipe a doughnut ring shape onto a square of parchment paper. Carefully slide the doughnut from the parchment paper into the oil to fry. Cook for about 1 minute per side, or until both sides are golden brown. Transfer to a paper-towel-lined plate to drain and cool. You can toss hot, freshly cooked doughnuts in powdered sugar or cinnamon-sugar before cooling. However, if you want to frost the doughnuts, allow them to drain on paper towels and cool completely first, then dunk the top half into any type of glaze or frosting you prefer. What Happens if I Don't Put Baking Powder in a Pound Cake? How do I Make Egg White Frosting?